We would like to congratulate Gong-Ru Lin, GIPO professor, on his winning of the National Science Council's Department of Engineering and Applied Sciences' 2009 and 2010 “Excellent Electronic Engineering, Computer Science and Communication Poster Exhibition in Performance Presentation of Applied Technique and Knowledge Industry-University Cooperation Program" award. Congratulations! GIPO Professor Chung-Chih Wu receives the 2011 Outstanding Electrical Engineering Professor Award. We would like to congratulate Po-Sheng Wang, a GIPO Ph.D. student, on his winning, under the direction of GIPO Professor Chih-I Wu, of 2011 CTCI Foundation Technology Scholarship. Congratulations! 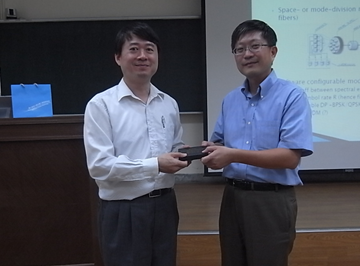 GIPO Professor Jr-Hau He receives the "IUPAC (International Union of Pure and Applied Chemistry) Prof. Jiang Novel Materials Youth Prize". Congratulations! 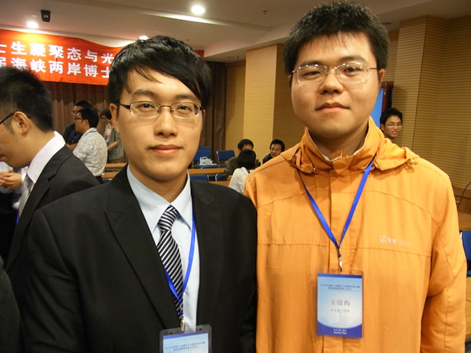 GIPO Professor Jr-Hau He receives the "2011 Electronics Devices and Materials Association's Outstanding Youth Prize". We would like to congratulate Jr-Hau He, GIPO professor, on his winning of "the 1st Youth Photonics Engineering Award (originally named: Youth Optics Engineering Award)" in Taiwan Photonics Society's 2011 optics award. 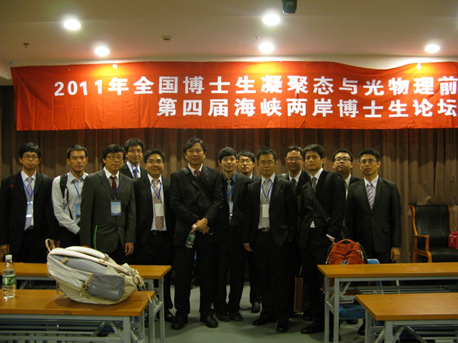 We would like to congratulate those students who participated in the 2011 International Photonics Conference, held at National Cheng Kung University during Dec. 8~10, 2011, on their excellent achievements and on the prizes awarded! Congratulations to Ph.D. student Chun-Lin Chang on his winning, under the direction of Prof. Sheng-Lung Huang, the 2011 "Defence Industry Scholarship" from the National Defense Industrial Development Foundation. We would also like to congratulate Prof. Jr-Hau He on his becoming a member of the Global Young Academy (GYA). 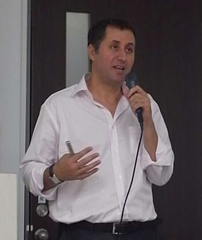 Prof. Azzedine Boudrioua visited GIPO on Oct. 14th (Friday) and delivered a speech, ”Optimal Design of Organic Laser Diode”, at room 205, Min-Da Hall. This was the 2nd time he visited GIPO. His speech was marvelous, well-considered in every respect and he interacted well with the audience. GIPO Professors and students participated in this event with enthusiasm and gained a lot from it. Director Te-Sheng Wei visited GIPO on Oct. 28th (Friday) and delivered a speech on “About the Movie - Seediq Bale” at the auditorium of the 1st Student Activity Center. Born in 1969, he took part in the production of several movies and TV programs during 1993 and 2002, including: "The Breath", by the Japanese director Kaizo Hayashi. "Mahjong", by director Edward Yang, and "Double Vision", by director Kuo-Fu Chen (Wei was the planner and assistant director in this film). Meanwhile, he has also directed several movies, including: "About July", in 1999, which won the Dragons and Tigers special prize at the Vancouver International Film Festival (Canada), and "Cape No.7", 2008, which was the best-selling Taiwanese movie in Taiwan history, and won the Gold Horse Award for that year's outstanding movie, audience-chosen best film and the best supporting actor as well as 1st prizes at international film festivals in Hawaii and Japan. In 2011, he completed "Seediq Bale", which was nominated for the 68th Venice film festival. This symposium was wonderful, all seats were occupied. 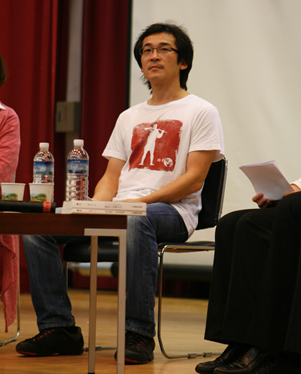 Students asked questions with enthusiasm and interacted with Director Wei. All the participants benefited greatly from this experience. 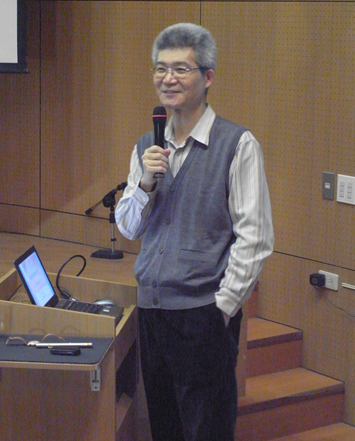 Dr. Steven Yang visited GIPO on Nov. 4th (Friday), and delivered a speech on “Coherent Optical Communication: An Industrial Perspective”, at auditorium 105 of EE II Building. His speech was fascinating, well-considered in every respect and he interacted well with the GIPO professors and students who took part in this event. The participants attended with great interest and benefited greatly. Dr. Ming-June Chow visited GIPO on Nov. 11th (Friday), and delivered a speech on “LED Illuminates the Future”, at auditorium 101, Barry Lam Hall. His speech was interesting. GIPO students participated with enthusiasm and benefited greatly from the experience. 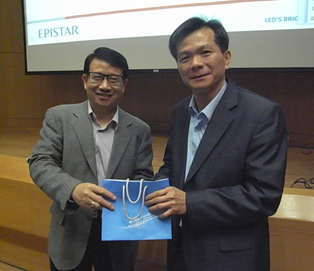 Prof. Sooder Yao visited GIPO on Nov. 25th (Friday), and delivered a speech: “The Study of Thin Film Materials' Microstructure and Elastic Strain, Using Nucleus Analysis Technology”, at auditorium 101, Barry Lam hall. Her speech was splendid, well-considered and he interacted well with GIPO professors and students. All the participants attended with enthusiasm and benefited greatly. 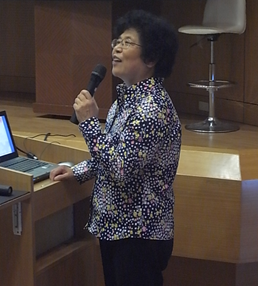 Prof. Yuan-Hui Hu visited GIPO on Dec. 16th (Friday), and delivered a speech, “Technology = A Beautiful New World? - A Reflection From the Communication Domain”, at auditorium 101, Barry Lam Hall. His speech was fascinating, well-considered in every respect and he interacted well with GIPO professors and students. Participants were very enthusiastic at the event, and everyone benefited greatly. 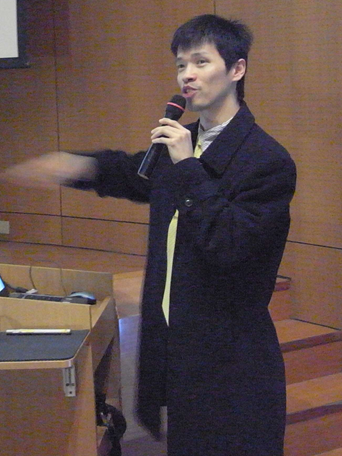 Dr. Taya Chu visited GIPO on Dec. 23rd (Friday), and delivered a speech, “Development of High Performance Organic Photovoltaics”, at auditorium 101, Barry Lam Hall. Dr. Chu's speech was splendid; GIPO professors and students flocked to his speech and gained a lot from the event. 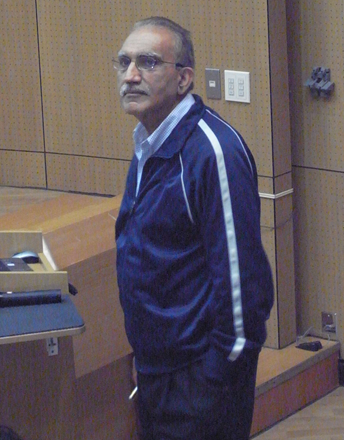 Prof. Devki N.Talwar visited GIPO on Dec. 30th (Friday), and delivered his speech on "Phonons, Defects and Electronic Properties of Modern Compound Semiconductors: SIC, III-V, Dilute Nitrides and Related Materials" at auditorium 101, Barry Lam Hall. His speech was wonderful; GIPO professors and students participated with enthusiasm and were eager to ask questions. Everyone benefited greatly from it. 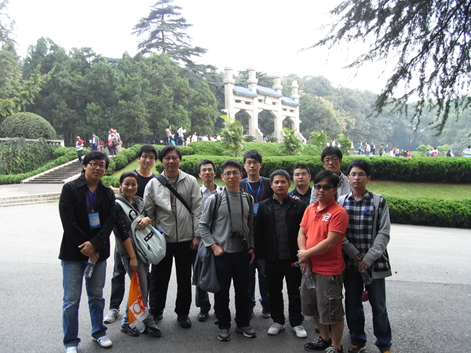 On Oct.10, 2011, the 100 years' birthday of the Republic of China, we arrived at Nanjing, the former capital of the R.O.C. For both sides' students and professors to meet and interact in such circumstances, the significance is extraordinary. I was very happy to be able to attend the 2011 exchange between GIPO and NU Physics College. I had heard of this event before and felt honored, and a bit nervous, being a member and the captain of our team, responsible for contacting NU in dealing with students' affairs. Hereunder, I would like to share with you firstly, my experience and what I've learned in performing my duty; secondly, what I've learned after having attended this event. While thinking of attending this event, I learned some of its history from Ms. Hsiao-Wen of the GIPO office. This is the 4th time of the GIPO and NU Physics College's exchange. Every year, each university takes turns to visit the other. Last year, NU came to Taiwan, and therefore, we visited them this year. In addition to academic seminars, there are cultural tours, visiting each other's places of historic interest and scenic beauty. As guests, we were more relaxed in the preparation for this event. All schedules were arranged by 3 young NU teachers, Liang Sun, Gang Zhao and Xiang Xiong. Among them, Xiang Xiong came to visit us as a student last year; after having graduated this year, he is now a NU teacher and NU's contact person for this event. He was also my main contact. I have since realized that the aforesaid 3 teachers are more like lecturers than professors who could accept students as disciples. They are younger as well. Our team members met 3 times before heading for Nanjing. In the 1st meeting, each member provided a brief self-introduction, including which laboratory he/she came from and his/her field of study. Then each of us was assigned to a post on the team, and all members discussed our flight schedules. In the discussion, some said that mainland airlines were not safe enough; however, there were no Taiwanese airline flights that matched our schedule. In the end, we had no alternative but to take mainland's East Airline. After having taken East Airline, I feel that taking off and landing were OK, but the aircraft departed for more than half an hour late, and most members said the service of the flight crew was quite poor. Consequently, I would suggest that, if scheduling allows, future members fly with a Taiwanese airline instead. During the 2nd meeting, I collected members' CV and summaries of their reports, and then sent them to NU's contact teacher - Xiang Xiong. The PowerPoint of our reports were collected by Chung-Lun Wu, the assistant captain of our team. Although accompanying teachers would attend our seminars, these seminars would be basically conducted by students themselves. 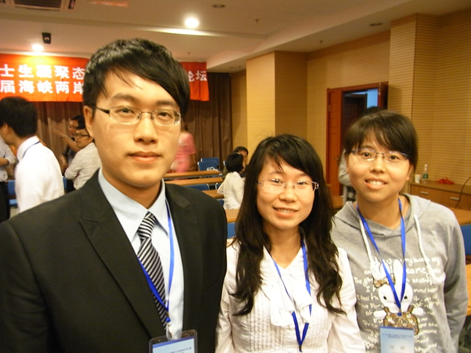 Therefore, we also selected a host for each of the 3 seminars: they were Chung-Lun Wu, Chun-Lin Chang and Chien-Yu Chen. These 3 would co-host the seminars with 3 NU students, and they were very serious about their duties, reviewing the NU students’ reports beforehand in order to guide and encourage discussions. The 3rd meeting was basically an introductory orientation. Our schedule was confirmed, and a checklist for things-to-carry was made. This was the 1st time I visited mainland China. Some said Nanjing is not a big city. However, walking on its streets, I felt that it almost looked like Taipei. It was as I had heard before; the mainland's buildings and infrastructures are above par, and perhaps even superior to those of Taiwan. However, on its streets, cars would not give way to pedestrians and horns were sounded constantly. I then realized that Taiwanese people were still better-mannered. With that being said, the students we met during the exchange and on campus were much more friendly and polite, possibly because of their education. In addition to learning a great deal during our academic exchange, we also were impressed greatly by the grand scenery of Mt. Huang and the ruins of an ancient Huay-Sun village during the cultural tours. In addition to interacting with NU students during this week, I believed that it's even more important that our own members got to know each other better than ever before after this event. Every one of us came back enriched. I would suggest you join the team in the future if you have the opportunity. I was honored to be able to attend the 4th exchange with Nanjing University's doctoral students. 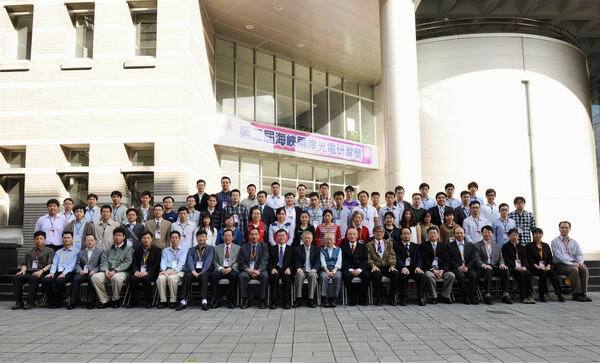 This time, Nanjing University expanded the event into a "2011 Nationwide Doctoral Students' Leading Edge Forum of Condensed Matter and Optoelectronic physics, and the 4th Cross-strait Doctoral Students' Forum". Therefore, besides NU and GIPO, there were also students from Soochow University, Sun Yat-sen University, Nankai University, Shanghai Jiao Tong University, Nanjing University of Science & Technology, Whyyoung Engineering College and Tsinghua University. Students made use of this opportunity to exchange ideas about research and life. First of all, we would like to thank NU's teachers and students for their kind hospitality, which made this event not only a successful academic exchange but also a precious historical and cultural journey. We, students, accompanied by Chairman Ching-Fuh Lin, Vice Chairman Chih-I Wu, Professor Zhe-Chuan Feng, and Professor Jr-Hau He, had a wonderful time enjoying these 7 days' activities. On the 1st day, the 4:30 pm plane did not start boarding until almost 6 pm, and arrived at Nanjing Lukou International Airport at almost 8 pm, and this delay kept the receiving NU teachers Liang Sun, Gang Zhao and Xiang Xiong waiting for a long time. On the bus, Liang Sun briefed us on the schedules of the next few days and Gang Zhao, along the way, introduced to us the geographical environment and historical background of Nanjing. During the next two days of the seminar, through the guest reports and student exchange research reports, we were deeply impressed by mainland students' conscientiousness about theories and fluency in logic reasoning, giving us a lot to learn from. In daily conversations with the mainland students, we often talked about things like the educational system, work, entertainment, traffic, food etc., and seldom talked about the sensitive subjects between both sides. Hereunder, I would like to elaborate on the above-mentioned things. The mainland's educational system requires 3-year study for master or doctor degree; however, Taiwan's system requires 2-year and at least 4-year studies to earn master and doctor degrees, depending on each student's accomplishment. Their doctor graduates could stay in the same school and work as a lecturer, which is equivalent to our assistant professor. One thing is unique in their system: the mainland's professors do not have as much autonomy as we do. 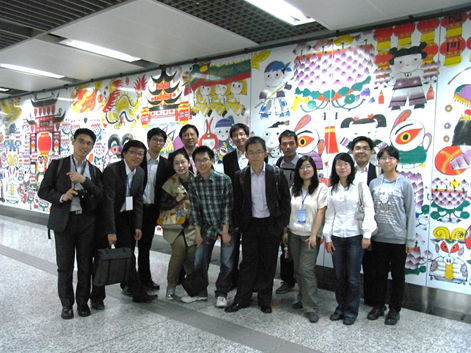 In mainland China, a head professor leads a group of professors to do research. With regard to work, the starting salary of their master graduates in industries is about 6,000 to 8,000 RMB and that of doctor graduates in industries in big cities is 10,000 to 12,000 RMB. However, industries in small cities can not afford to pay for the aforesaid doctor graduate's salary. Doctor graduates have to accept a master graduate's salary if they wish to work in small cities. If doctor graduates teach in school, their salaries would be less than 4,000 RMB. As for entertainment, mainland students are very similar to Taiwanese students. They like listening to and singing pop songs, watching idol dramas and surfing the internet to pick up new information and share inner thoughts. What makes me feel happiest is that they love Taiwan's dramas more than we do. Because of the popularization of Beijing language, except for some retroflexion when they talk, we are unable to hear any difference from us when they sing Taiwan's pop songs. In addition, because of their state's policy, mainland China has blocked many websites and softwares. We use mostly msn and facebook for web chatting, but mainland students use QQ and www.renren.com instead. Use their websites if you would like to get to know them better. Mainland China has many of their own sport equipment brands, such as Lining or Annta sports. We realized that they seldom buy well-known European or American merchandise, which reminded us that Taiwanese students should learn from them and buy more MIT products. Nanjing's transportation is convenient and smooth. There are lots of buses and taxis on the road. The interior designs of their buses are the same as those of Taiwan's air-conditioned buses. The starting cost of taking a taxi is 9 RMB, which is comparatively less expensive. However, passengers have to pay 2 RMB more for fuel tax if they ride during nighttime. NU students ride bicycles on campus, same as we do. On top of that, there are some electric bicycles which are quiet and not too fast. But, because it does not have an engine to make noise, electric bicycle riders seem to enjoy sounding their horn in a long and continuous way to make sure everyone hears them. NU students told us that because, in the mainland, no one is afraid of vehicles, riders have no alternative but to do this to protect themselves. 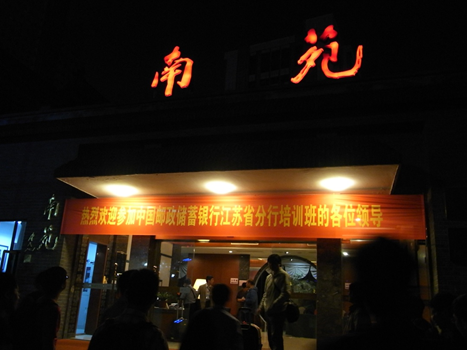 The hotel we stayed at is "Nanyuan", located in NU's campus, which is used for the specific purpose of receiving foreign guests. Its facilities are quite good, including internet, TV and bathroom facilities. We would like to thank NU for going out of their way to provide us with power outlet adapters. The shower stall is semi-transparent and quite “atmospheric”, and this made us a little embarrassed. But, really, there is nothing to be embarrassed about since we’re all guys. We were also told that there is a women’s dormitory by Nanyuan, which is the biggest in Asia, and the men always look forward to visiting at the beginning of each semester, when they can use the excuse of helping girls move in. NU's female students have said that because there are no drapes in their dormitory, they have to paste wallpapers on the window or hang clothing by it. In addition, because there is no hot water in their dormitory, students have to bring their soaps and washbasins during evening to bathe at the student bathhouse. Although I considered taking a shower in the student bathhouse for the unique experience, after a long day's activities, it was always closed before I was free. Concerning food, we would like to thank NU for providing us with an abundance of delicious dishes during mealtimes. NU students introduced famous local dishes to us, such as "duck’s blood & green bean noodle hot pot", "rock sugar glutinous rice lotus root" and "pressed, dried & salted duck". The most famous local food is "Yangcheng Lake Daisy Crab”. As a poem reads: "When Autumn wind blows, I follow the smell of crab here", the Yangcheng Lake Daisy Crabs have grown fat with roe and meat during this time. What interests us the most is that NU students have told us that there are 3 kinds of Daisy Crabs: locally-born and bred Daisy Crab, foreign-born and locally-bred Daisy Crab, and lakeside-bred Daisy Crab. Sounds interesting, doesn’t it? 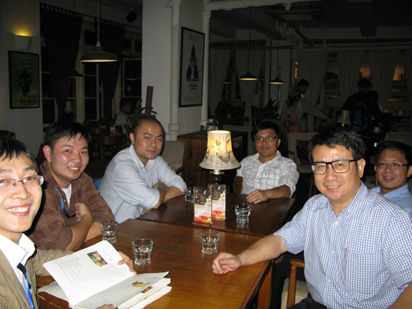 In addition, we witnessed the great drinking capacity of Deputy Dean Zhenlin Wang. Our Chairman Ching-Fuh Lin can also hold his drink quite impressively. Since it was the centennial birthday of R.O.C. and the centennial anniversary of national father Yat-Sen Sun's 1911 revolution when we were visiting NU, it meant a lot to make the pilgrimage to Yat-Sen Sun's tomb at that time. 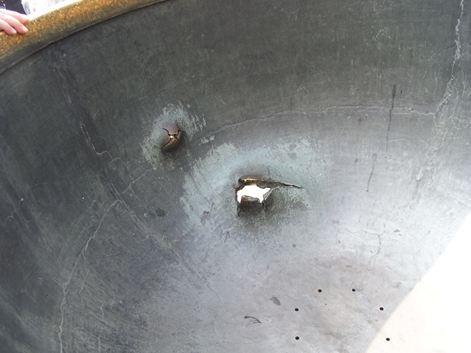 On a platform up the stairs of his tomb, there are two big tripods, on the sides of those tripods; there are some bullet holes, which were left by Japanese soldiers when they invaded China during World War II. A proverb says: "The small and weak will be bullied, and those who fall behind will be beaten." NU students have told us that this proverb comes from "Quotations from Chairman Mao Tse-Tung", and worth some reflection. Speaking of quotations, like us, mainland students have to take dogma thought classes. Nevertheless, like us again, they have also gradually come to ignore the strictness of these things and just take them as references. After 7 days of exchange and time spent together, as usual, both teams chose one member of the other for the congeniality award. 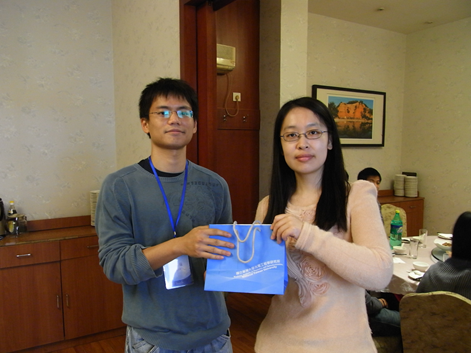 Our captain Liang-Yi Chen and NU's Ming-Xue Li, who have accompanied us all these days, won the honorable prize. In conclusion, we would like to thank GIPO for providing us with this excellent opportunity to get to know so many mainland friends and establish better relationships with other GIPO students. We have also gained a lot in academic achievements through the interaction. Above all, we would like to thank NU teachers and students for their hospitality. This was truly a worthwhile and greatly beneficial trip. 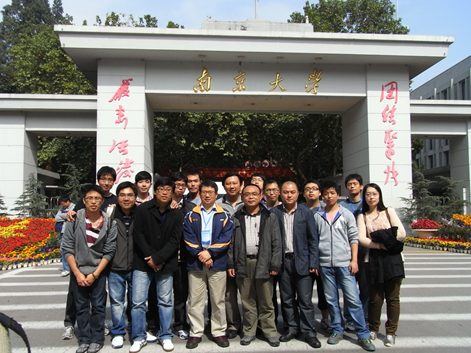 After having successfully held the 1st cross-strait photonics study camp last December, GIPO Prof. C. C. Yang has once again held the 2nd at Barry Lam Hall, EECS, during Nov. 28~30, 2011. At 8:30 am on Nov. 28, under the supervision and blessing of Chao-Han Liu, former associate dean of Academia Sinica, Tzong-Ho Bau, vice president of NTU, and Lin-Shan Lee, dean of EECS, the camp started its 3-day-long packed agenda. There were 10 teachers and 24 students (post-doctorate researchers and Ph.D. students) from mainland's Peking University, Tsinghua University and Nanjing University, and 20 teachers and 24 students from our National Taiwan University, National Tsing Hua University, National Chiao Tung University and National Cheng Kung University attending this camp. Its agenda includes: lessons given by teachers, oral presentations given by the students, and poster exhibitions, and cultural tours. The purpose of holding this camp is to promote both sides' academic educational understanding and respect and to create further cooperation opportunities. It is a new undertaking and a learning process as well. 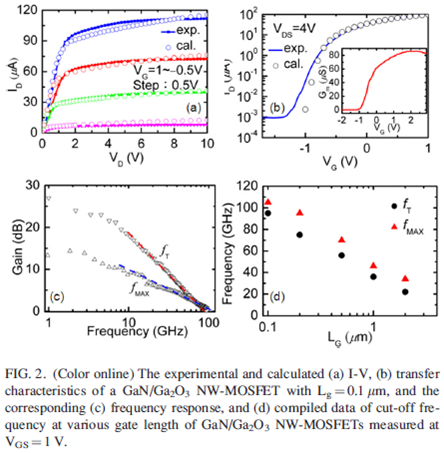 We reported the direct current (DC) and radio frequency (RF) transport properties measured on - GaN/Ga2O3single nanowire (SNW)-MOSFET devices. The devices were laterally- and directionally- grown on (0001) sapphire substrates using a home-built reactor invoking the gold-catalyst vapor-liquid-solid growth mechanism. For a 60nm-dia. Ga2O3/GaN SNW-MOSFET of 0.1mm gate length and drain-source distance of 1mm, we measured a saturation current of 160mA, current on/off ratio of 105, swing of 85mV/dec, transconductance of 85mS, and cut-off frequency ft/fmax of 95/105 GHz, respectively. From these measurements we identify the observation of electric mitigation over the short-channel effects such as Vt roll-off and improvement of S factor owing to the nanowire device aspect ratio effect similar to their III-V planar counterpart FET devices. 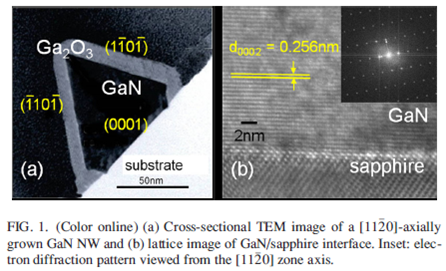 These improved transport properties were ascribed to the high-crystallinity and abrupt interfaces between sapphire/GaN and GaN/Ga2O3 as verified from the high-resolution transmission electron microscopy (HRTEM) analysis. From a 3D diffusion and drift model analysis, we reconstructed the transistor’s current-voltage (I-V) characteristics by incorporating a sheet of high mobility (m = 1000 cm2/V-sec) electron gas (2DEG) of 7´1012 cm-2confined at the GaN/Ga2O3 interface. It proves the origin of 2DEG confined at the semi-polar GaN/Ga2O3interface is caused by the discontinuity of the spontaneous polarization Psp effect to screen out the polarization-induced fixed charge therein. Its magnitude conforms to a law of cosine dependence (q = 62°) to the bulk GaN Psp value of -0.029C/m2. These observations illustrate the virtues of using a simple architecture of Ga2O3/GaN NW-MOSFET structure to pursue the scaling-down issues of integrating the III-V nano-transistors on the silicon-based CMOS platform. We have been dedicated to development of oxide semiconductor thin film transistors (TFTs) in recent years due to their various merits, such as high mobility in amorphous phase, low processing temperature and transparency etc., promising for various novel applications. (1) We had developed high-performance transparent oxide TFTs (Fig. 1) based on amorphous In-Ga-Zn-O (a-IGZO) with a mobility m of up to 45 cm2/V×s, a sub-threshold swing SS of 0.4 V/decade, an on/off ratio of >107, and good stability (small DVth of <0.2 V after extended current stressing). Active-matrix OLED displays using such oxide TFTs had also been demonstrated in a collaboration work. (2) We had also developed high-performance and highly flexible a-IGZO TFTs on fully transparent polyimide-based nanocomposite substrates (Fig. 2) using conventional micro-fabrication processes that are compatible with existing production technologies. The flexible a-IGZO TFTs exhibited a decent m of up to 16 cm2/V×s, a SS of 0.4 V/decade and an on/off ratio of >108. The devices could be bent down to a radius of curvature of 3 mm and yet remained normally functional, with only small changes of TFT characteristics vs. applied strains (compared to a-Si). (3) In addition to device technologies, we had also developed the physical modeling of carrier transport and the subgap density of states in amorphous oxides for device simulation of oxide TFTs operated in both the depletion/enhancement modes, which shall be of general use for designs of oxide TFT devices and circuits (Fig. 3). Fig. 1. (a) Photo of transparent oxide TFTs. (b) Output and transfer characteristics of transparent a-IGZO TFTs. (c) Prototype AMOLED using a-IGZO TFTs. Fig. 2. (a) Photo of micro-fabricated flexible a-IGZO TFTs on transparent polyimides. (b) Output characteristics of flexible a-IGZO TFTs. (c) Flexible a-IGZO TFT characteristics vs. bending radius. (d) Flexible a-IGZO TFT mobility vs. strain. Fig. 3. (a) Physical modeling a-IGZO TFTs. (b) Tight fits of measured TFT characteristics with simulation. (c) Extracted subgap density of states of amorphous oxide semiconductors. For typical organic light emitting devices (OLEDs) with the hole mobility much larger than the electron mobility, the impedance versus voltage (Z-V) characteristics show a particular behavior which can be used to investigate many electrical properties of the organic layers. The impedance of these devices presents a transition from a higher value to a lower value before the device turns on, which indicates that the hole transport layer (HTL) reaches flat band and becomes conductive first. The voltage at where this transition occurs is named the transition voltage, and the difference between the transition voltage and the turn on voltage is dependent on the thickness of the electron transport layer (ETL) and the density of the accumulation charges. In this work, devices with systematically varied thicknesses of ETLs and four kinds of cathode structures were investigated. The transition voltages versus the thickness of the ETL characteristics in Fig. 1 show that the transition voltages of the devices with an electron injection layer (EIL) shift toward higher bias while the slopes of all these devices remain constant. The shift of the transition voltage is proposed to result from the diffusion of the cathode structures into the organic layers which decreases the effective thickness of the ETL for capacitances. Therefore, the diffusion length of these cathodes can be estimated from the shift of the transition voltages of each group of devices. Fig.1 The transition voltage V0 versus thickness of the ETL (Alq3) characteristics. The film structures of these devices are ITO/NPB(800Å)/Alq3/cathodes. Traditional methods of detecting cancer cells, such as fluorescence, have their limits and can hardly be used for identification during tumor resection. Here we report an alternative tumor detection technology using ZnO nanorods bonded to antibodies as cancer cell probes. Our experiment shows that EGFR(Epidermal growth factor receptor) can be connected to ZnO nanorods and to EGF receptors of SCC(squamous cell carcinoma). The cancer cell can be recognized by the bare eye or the optical microscope with the help of purple light emission from ZnO/EGFR antibody probes. On the other hand, for cells with less expression to EGFR, in our case HS68, no purple light was observed as the probes were washed-off. 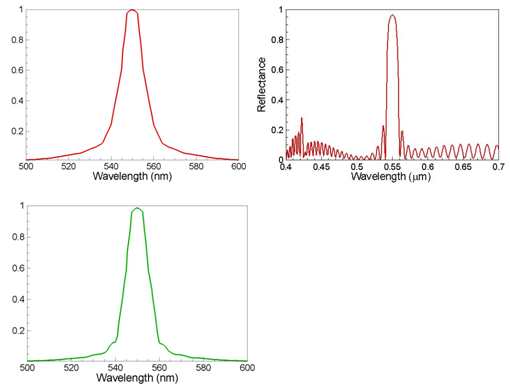 From the photoluminescent spectra, the peak intensity ratio between the purple light (from ZnO at the wavelength 377nm) and the green band (from the auto-fluorescence of cells) is much higher with the presence of SCC, as compared with HS68. The ZnO/EGFR antibody probes have the potential to be applied to real time surgery for tumor cell identification. The cancer cells will be excised with the help of purple light emission. Fig.1 Experimental flow of ZnO antibody probes bonded to SCC(cancer cells) (a) and HS68 (b). The nanorods without antibody were also employed for comparisons. (c)&(e) The strong UV-VIS band ratio indicates the existence of SCC while very weak UV light for HS68 samples ((d)&(f)). Solar-cell-integrated organic light-emitting diodes (OLEDs) were fabricated with both high contrast ratio and energy-recycling ability. However, the luminous efficiency of the integrated devices is reduced to 50% of that of conventional top-emitting OLEDs. A novel structure to recover the luminous efficiency from 50% to near 85% by applying a distributed Bragg reflector (DBR) was demonstrated. It saves about 40% of the electric power of that of a device without a DBR. The contrast ratio remains high compared to that of conventional OLEDs. Simulations were conducted first to prove our models and assumptions. Then, two types of thin-film solar cells – CdTe and CIGS solar cells – were used. They had different contrast ratios as well as viewing-angle properties. Finally, the emission spectrum was calculated to be 11 nm FWHM, which is narrower than that for the emission spectrum of a typical microcavity OLED and has the advantage of having saturated colors. Fig. 1 (a) Concept of the solar-cell-integrated OLED; (b) concept of our DBR design; integration of a DBR to enhance the outcoupling efficiency. Fig. 2 (a) Input microcavity-OLED emission spectrum; (b) DBR reflectance of a CdTe solar-cell-integrated OLED; (c) output microcavity-OLED emission spectrum for a CdTe solar-cell-integrated OLED. We derive a full-vectorial finite-difference formulation similar to the transfer-matrix method (TMM). A field and its derivatives are represented with vector Y. The field just at the left and the right of an interface is related by a matrix MMBC, and the vectors at homogeneous region are related by Taylor series expansion MTSE. As in the TMM, the vectors at different positions are then related by multiplying the matrices. Finally, we can get the relation of vectors stepping over any layers and the finite-difference formulation is then obtained. Such scheme has an advantage that the grid size is not limited by the layer thickness and can be arbitrary. It is not necessary to put several points to model one thin layer as before. Therefore, the computation time and memory are greatly saved. In the numerical results, we will apply the technique to two-dimensional partially-filled and ridge waveguides with MQW structures. We apply this technique to a PEC-bounded MQW-buried ridge waveguide structure as shown in Fig. 1(a). The multilayer structure consists of 31 barriers and 30 wells. Refractive indices of barriers and wells are nbarr = 3.2874 and nwell = 3.3704, and widths of each barrier and well are 12 and 7 nm, respectively. Magnetic-field formulation, curved corner, and non-uniform grids are used to properly model singular field behavior around sharp corners. Smallest Dx and Dy are set to 1 nm around the corners, and maximum Dx and Dy are located at outer region of the computation domain. Grid number comparisons along x-direction are shown in Fig. 1(b). 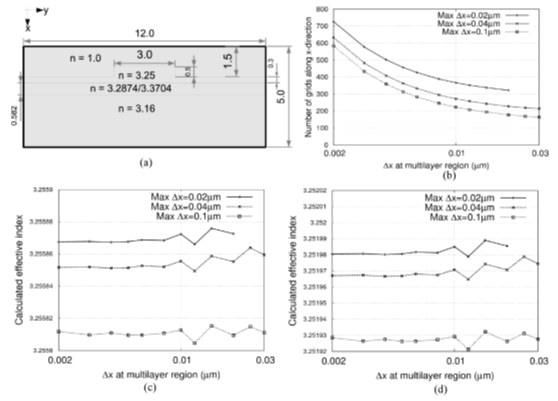 Effective indices of fundamental quasi-TE and quasi-TM with respect to MQW-region and maximum non-uniform Dx size are investigated and illustrated in Fig. 1(c) and (d), showing TMM-based scheme yields less error compared with that from non-uniform grid. These results also indicates that the calculated effective index increase insignificantly with grid size of MQW layers, since the truncation error due to small grids in MQW layers plays minor role in the total error. Fig. 1 Simulated ridge waveguide with multilayer structure. (a) Cross-section, (b) Number of grids on x-direction, (c) calculated effective indices of fundamental quasi-TE and (d) quasi-TM modes with respect to grid sizes in MQW region and maximum. In conclusion, we have successfully implemented TMM-based finite-difference waveguide analysis. Results show better convergence performance compared with conventional method. Simulation efforts of structures with thin multilayers can be greatly reduced. Since multilayer structure is very common in various photonic devices, this can be widely used in various photonic design.